Personnel - Dave Ballou: trumpet; Anthony Pirog: guitar; Adam Hopkins: bass; Mike Kuhl: drums. 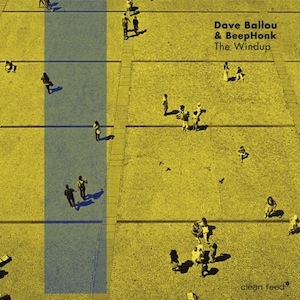 Trumpeter Dave Ballou has been a ubiquitous presence on the avant-jazz scene, participating in projects of likes such as bassist Mario Pavone, French hornist Tom Varner, pianist Satoko Fujii, and drummer John Hollenbeck. His second Clean Feed outing, The Windup, features a quartet that first played together in 2011 at the Windup Space in Baltimore, Maryland, where the bassist Adam Hopkins used to organize weekly concerts to promote collaboration between improvisers. Breaking the initial purpose of a one-time-only performance, the ensemble that played at that time - Ballou, Hopkins, guitarist Anthony Pirog, and drummer Mike Kuhl - reunited recently at the same place to explore Ballou originals. “Fluffer Nutter” kicks in with trumpet and guitar asserting a phrase that keeps being suggested throughout, even after the musicians disperse their attention to focus on alternative yet still-communicative ostinatos. While Kuhl employs jittery ride cymbal, Hopkins sticks to a methodical pizzicato, completing a foundation that invites the guitarist and the trumpet player to persevere interaction. Before the peaceful ending, Pirog devises a crackling, exploratory, acid-rock-driven improvisation suffused with electronic momentum. “BeepHonk” borrowed the title from the band’s name, taking us to a ruminative 15-minute journey initiated by bass alone. Hopkins’ thumping pizzicato is followed closely by the drummer and ultimately drizzled with bird-like electronic noises and curt remarks of a muted trumpet. At some point, the music earns a strong chamber feel that couldn’t be held out due to the uncanny synth vibes created by Pirog, a true specialist in digital manipulation. Lasting for more than 26 minutes, the final piece, “Nice Spot - Another Fool” recuperates that chamber aura that places the band somewhere between fragility and sturdiness. By giving the rhythm a bit more profundity, the band designates Pirog as its catalyzer, and he responds by whether intensifying texture or pacifying the waters with the use of relaxed harmonic sequences. Serene passages, adorned with homespun electronic effects and mysterious dark drones, alternate with inharmonic gravitational spins. The last five minutes are marked by a rhythmic effervescence, promptly roughened by distorted guitar. This is a rewarding effort from Ballou and his peers, who knew how to stuff the inventive structures with enjoyable musical moments.